Few days ago, Linux Mint 14 (Nadia) was released, so I decided to give it a go. I downloaded the ‘Cinnamon’ version, and as soon as the download fished, I went ahead and wiped out Ubuntu and installed Linux Mint 14. Within the first few minutes of using the Cinnamon desktop, I said to myself, wow!, and let me tell you why. 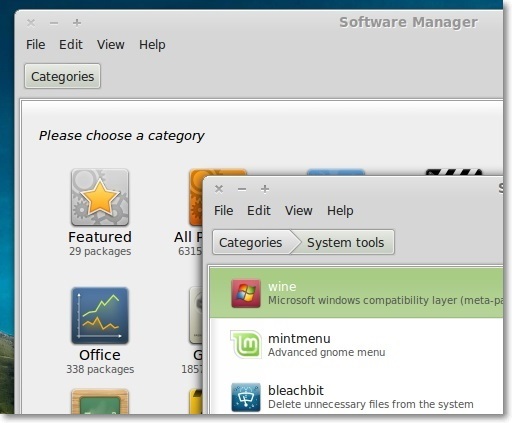 Linux Mint developers originally tried to fork the Gnome Shell desktop by using the ‘Mint Gnome Shell Extensions’. But after seeing the drawbacks of using mere extensions to customize a desktop, as they are after all extensions, and only let you customize the desktop up to a point (from a developer’s point of view), they decided to fork core utilities of the Gnome Shell. 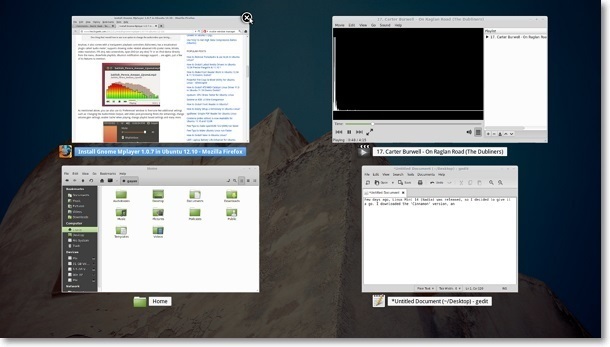 Such as the ‘Mutter’ window manager, ‘GDM’ display manager, ‘Nautilus’ file manager etc … and came up with a desktop environment of their own called ‘Cinnamon’. 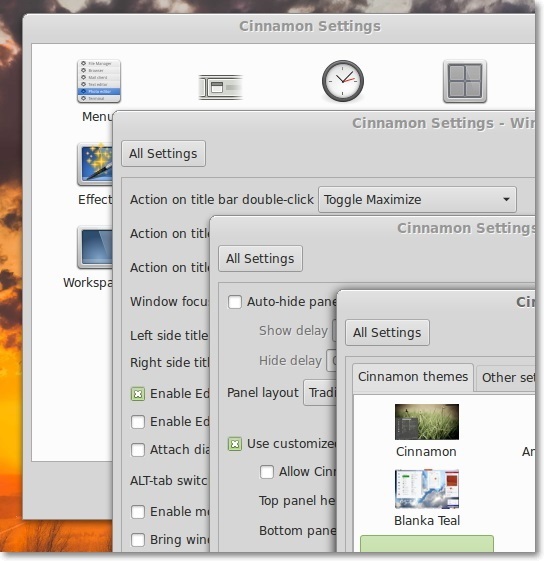 As most knows, the ‘Cinnamon’ desktop was created having one thing in mind, and that was to give users a classical looking desktop experience, such as the one ‘Gnome 2’ gave. 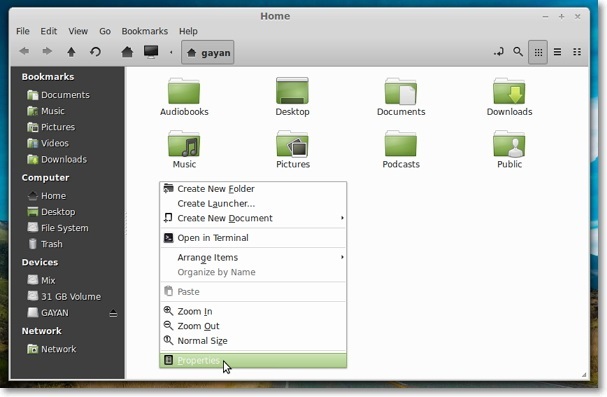 Though it’s barely 10-11 months old, since they first announced the initial development of the ‘Cinnamon’ desktop, thanks to the already matured Gnome Shell’s underlying core utilities, I gotta say, Cinnamon 1.6.7 that comes with Linux Mint 14, considering both usability and stability, is looking extremely impressive!. 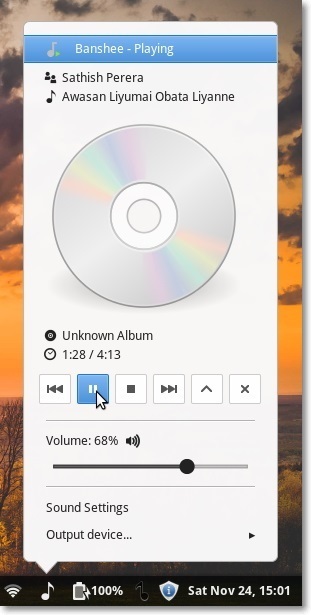 As you can see above, the desktop interface of Cinnamon looks very much alike the one in Microsoft Windows (7 and later as the one with 8 is a bit different). And on the desktop background you will find the standard icons that leads to places like ‘Computer’, ‘Home’, ‘Network’ etc as usual. 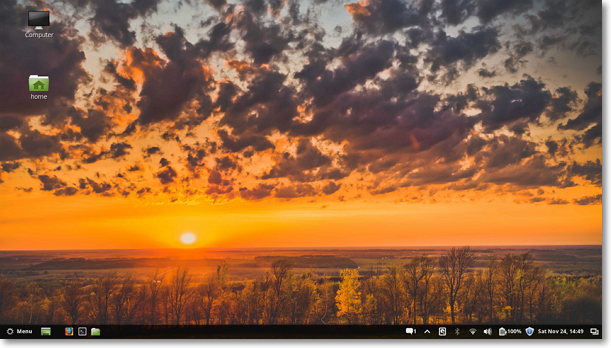 I don’t know about you, but I have been using Windows for a long time and always liked Windows Start menu. Though starting with Vista, it underwent few changes that I’m not so fond of that makes the navigation a bit difficult. But I gotta be honest with you. I absolutely love the ‘start menu’ design in Linux Mint 14 over the original Windows’ one!. Not only the ‘Bookmarks’ that are located on the left-side is a nice touch (plus showing a list of ‘Recent Files’), but when you move your mouse over to a Sub menu icon, it automatically opens the program icons inside that sub menu to the right, making it a breeze opening them. When you search on it, both installed applications and your ‘recent files’ are also included on the results page as well. You can rearrange the Start Menu and their icons plus can change few other settings by simply right clicking on its icon. 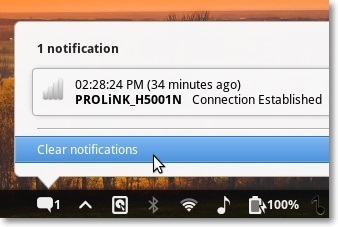 Next to the ‘Start Menu’ is the ‘Show desktop’ icon. 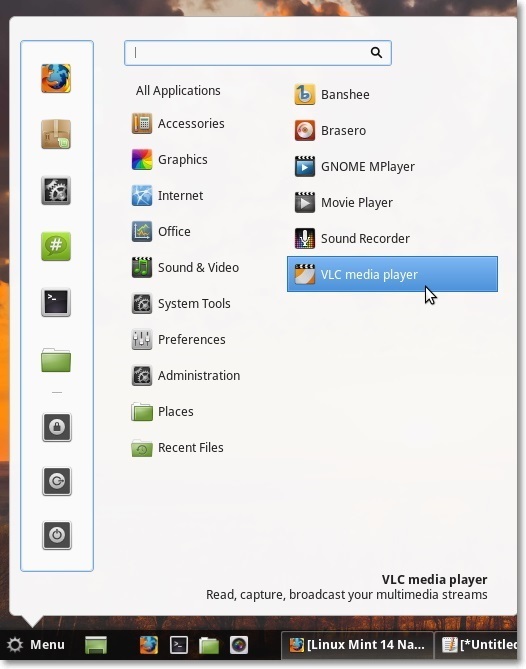 Once clicked, this minimizes all the opened applications and shows you the desktop. Next to this, also lies few shortcuts to common applications, (you can easily add/remove applications here), as shown in the above screenshot. Next we have the area where windows of opened applications are kept. 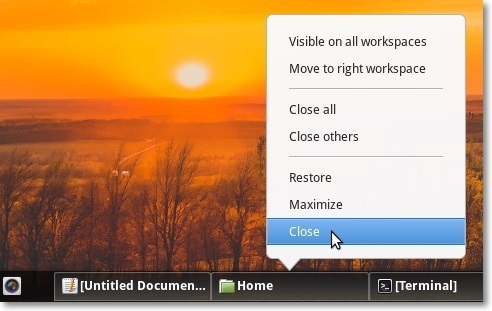 Here, when you right click on a window, you’ll be revealed a small but a useful context menu that lets you ‘Close’, , ‘Maximize’, ‘Restore’ and few others functions (Moving to a different ‘Workspace’) as well. I love this applet over the one you get in Unity and Gnome Shell, simply because it gives you two additional but handy features. One is to show the remaining/charging battery time in ‘Percentage‘ and the other is for making it display the ‘Remaining time‘. It does not sound like much, but little things like these are what make all that difference :). I do not find this to be that useful. Nevertheless, once clicked, it gives you a list of currently opened applications and the ability to bring them to front as well. 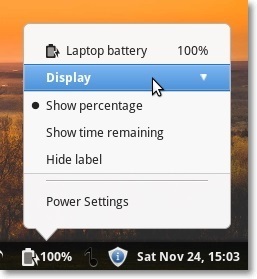 You also change the Panel height and its location, make it auto hide, if you prefer a more classic gnome desktop, with a top panel and a bottom one, then no problem, enter the ‘Panel Settings’ window (from the Panel’s right click context menu) and make your changes. 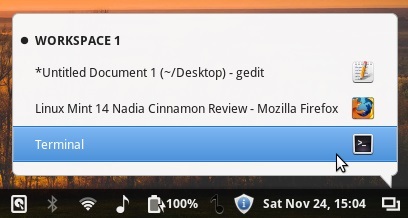 Just like with Gnome Shell, but different, Cinnamon also has a ‘ Left Hot corner’ on the desktop. 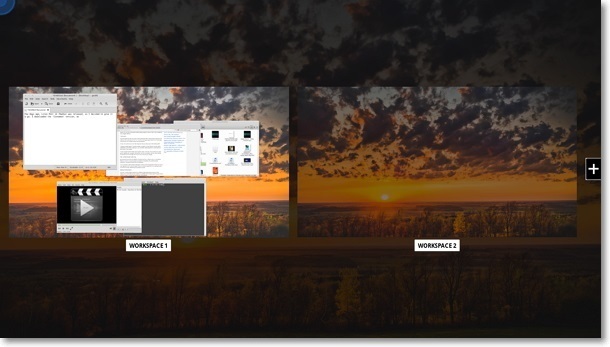 When you clicked on it, you will be given an overview of the desktop: the currently opened applications (including previews) and the ‘Workspaces’. You can use this to switch between Workspaces or bring to front an application, though you cannot close application like in Unity by default but you can easily change that from its Settings window. It also lets you easily add/remove new Workspaces from this ‘overview’ window as well. You know, I used to ‘forgive’ Ubuntu for not adding enough customizations options to their desktop, as it is still a bit new. But Cinnamon, as a desktop that’s not even a year old, gives you big number of ways for customizing the look-n-feel of the desktop!. It’s called the ‘Cinnamon Settings’ window. You can launch it in many ways (Start Menu, Taskbar etc), and from here, it lets you change things like the enabling/disabling desktop effects (including other tweaks), customize the Start Menu and the Panel, tweak the ‘Hot Corner’, change the theme (21 built in color styles, some also change the Start menu appearance), add/remove Applets from the Taskbar, enable/disable desktop icons, change the desktop background, change fonts and more. Are just a few of the included applications to mention. As you can see, there is no shortage of applications in Linux Mint 14. You have three multimedia players and three package managers! (no wonder why the download-able disc is about 923.8MB). And all the proprietary multimedia codecs are installed by default, so it works right out of the box. 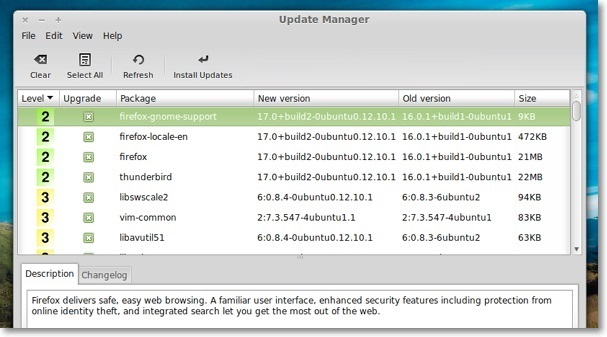 Due to the aggressive changes that occurred in recent versions of Nautilus (3.6+), as they removed few useful features, not just Linux Mint, even after a few months, Ubuntu (including many other distributions) too uses an older version of Nautilus (3.4). When compared with Nautilus 3.4, except for a few (such as ‘Open in Terminal’, ‘Open as Root’ etc on the right click context menu and few UI changes), Nemo is also pretty much the same. But according to the Mint developers, they have a lot planned for the future releases of Nemo anyway. This is the most important thing about the Cinnamon desktop, or the Linux Mint 14 OS in general. Though I have my issues with the Gnome developers, you gotta hand it over to them when it comes to designing robust applications. For example, one of the core utilities that has a lot to do while making the desktop robust and stable is called the ‘Window manager’. As it is its job, to create and manage the graphical user interface, that makes a desktop. A single major bug or a flaw in the design can easily make the whole desktop (OS?) unstable. 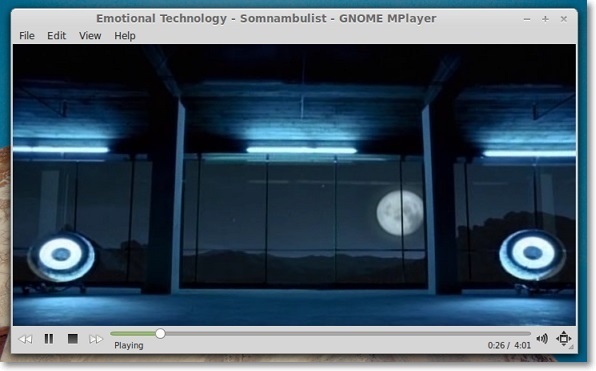 The one used in Unity is called ‘Compiz’, Gnome Shell uses ‘Mutter’ and based on that, Cinnamon has created one of its own and it is called ‘Muffin’. I have nothing against ‘Compiz’, but I have always preferred ‘Mutter’ over ‘Compiz’, even though Mutter is new, it feels lightweight and really robust, where ‘Compiz’ is known for its unstable issues, even though it has been there for sometime. Then again, tools like ‘Mutter’ has a lot of developers too. Anyway, it is perhaps because of this, that the Cinnamon desktop feels extremely robust and light weight. Except for ‘Nemo’ crashing twice, I had no problems whatsoever running Cinnamon on my Intel HD 3000 integrated graphics card. Note: I don’t know if I got lucky, because according to the release notes page, there is a risk of getting unusual GPU activity (only for users with Intel GPU drivers) which can lead to noisy fans and system heat-ups, though my Vostro V131 ran extremely smooth. Also, the whole desktop (taskbar, start menu, fancy effects, windows etc) in Cinnamon is managed by a single process called ‘cinnamon’. So if something were to happen to this process, then the whole desktop should be crashed. So just to check, how good it will be at recovering after such incidents, I manually ‘killed’ it. Then like two seconds later, it came back and there was my desktop as if nothing had happened! (in some ways, crashing the desktop won’t affect other apps. For example, when I ‘killed’ this process, I had Firefox opened few tabs, text editor with some text in it. Sure, they all disappeared. But with the desktop, they came back, as they previously were, without any data losses). This is not a unique feature to Mint, as if you ‘kill’ Compiz in Ubuntu then it too restarts and tries its best to come back. Plus, this was of course a simple test, but, at least, it’s good to know that Cinnamon can recover from such incidents (not always though). I also took a wild turn with in ;-). I wanted to see how well LM 14 would handle heavy multitasking needs of a modern user. So I decided to copy a 10, 919 of small files (altogether about 1.9GB) into my ‘Home’ folder, and while it was happening, I opened ‘LibreOffice Writer’, ‘Calc’, started to play a MP3 file with ‘Totem’, started play a video with ‘VLC’, opened the ‘Cinnamon Settings’ window, opened Brasero, opened the system monitor, opened a different window of Nemo and few other applications. And how well did Linux Mint 14 handled it? It handled it extremely well!!. I cannot emphasize this enough, perhaps this was because I had 4GB of RAM (with a 7200 RPM SATA disk, Core i3 processor), but I gotta say, it handled this ‘situation’ even better than Ubuntu or any other recent GNU/Linux distributions that I have used!. So when it comes to multitasking and OS responsiveness, I couldn’t be more happier. Few times, the shutting down process was delayed in Linux Mint 14. But I have also seen this with Ubuntu 12.10 in general and have traced it to an application called ‘Modem-Manager’. Since LM14 is also based on Ubuntu 12.10, this was not a surprise, and I can’t really blame the Mint developers for that either. 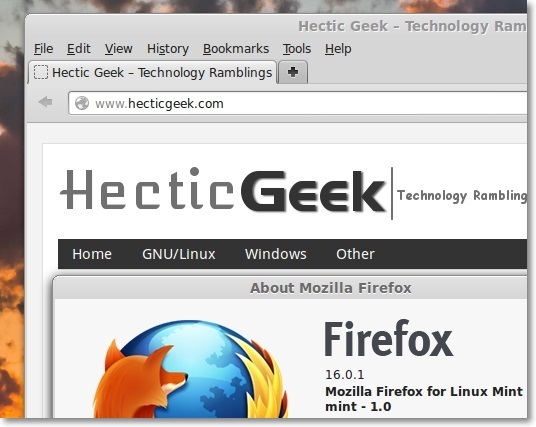 I did suggest a trick that worked for me in Ubuntu 12.10, have not tried it in Mint (will do later). If your shutting down process is also taking a long time to finish, then you can try this trick. Anyway, after that, I took a few measurements concerning the ‘Boot Speed’, ‘Memory Consumption’ and the ‘CPU usage at idle’ of both newly installed Ubuntu 12.10 and Linux Mint 14. Then created few graphs as shown below, for easy comparison. After selecting from the GRUB menu, I measured how many seconds it took for both operating systems to boot, fully into the desktop (without any manual tweaks, except, in Linux Mint 14, I disabled the Start-up ‘Welcome’ screen). 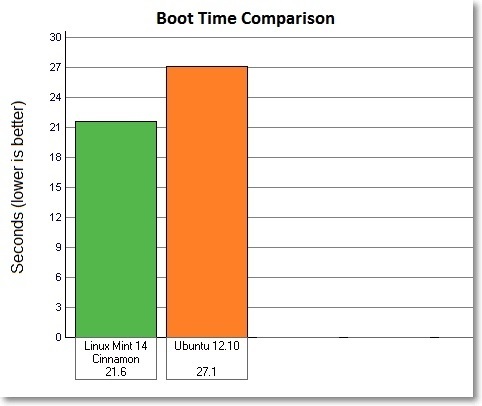 As you can see, Linux Mint 14 (which is also based on Ubuntu 12.10) booted 5.5-6 seconds faster (20%) than Ubuntu 12.10 did. So without manual tweaks, Linux Mint 14 is the winner (at least on my notebook computer). I measured the memory consumption of both operating systems, after loading the desktop using the Gnome System Monitor. Below is the result. 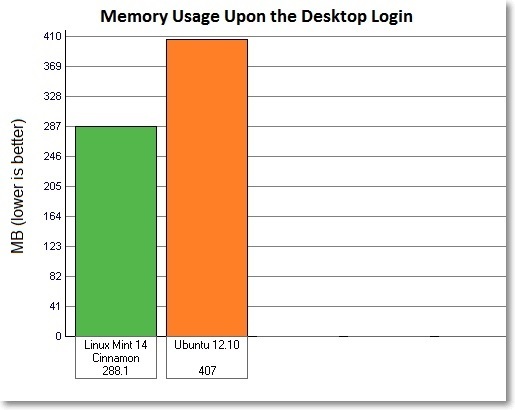 As you can see, even though they both use the same core utilities (Kernel, Xorg …), Cinnamon had somehow managed to use 119-120MB of less (29%) memory than the Unity of Ubuntu 12.10 used. Impressive!. Another way of measuring the quality of an operating system, is to measure the CPU usage when the computer is at idle. Though theoretically it should be using 0% of the CPU, under actual circumstances, this might not be the case. However, operating systems like Windows has an excellent reputation of being able to let the CPU idle (0% usage) for longer periods (most of the time my Windows 8 uses 0.2% CPU usage and achieves 0% for a reasonably longer periods too). I have not seen Ubuntu (nor other GNU/Linux distributions that I have used so far) doing that as impressive as Windows does, but mainly thanks to efforts from the Kernel team, these days, Ubuntu at idle, only uses about 1-2% CPU cycles on my notebook (far better than how it used to be). It was harder to measure this and come up with a graph with average result as it varied a lot. But, when roughly comparing, Ubuntu 12.10 did slightly better than Mint did, though Mint too used about 1-3% CPU usage most of the time when idle, using only 1% was a rare occurrence). Update (11/26/2012): Actually I was wrong. I used the ‘top’ utility to measure the CPU usage, but then I remembered that it by default does not divide the CPU usage by CPU count. In other words, when I said 1-3% usage at idle on Mint, it actually was using 0.25-0.7% of the total CPU power, because I have 4 cores and to get the actual CPU usage, I have to divide the readings of ‘top’ by ‘4’. So after that, all in all, Mint 14 again, has a very low CPU usage at idle, very nice :). If you are a Windows user, looking for a GNU/Linux desktop distribution that looks very much like the Windows desktop interface but is also impressively lightweight (compared to modern features it offers), then I humbly and highly recommend Linux Mint 14’s Cinnamon edition. Lastly, I would like to congratulate ‘Clem’ and the other Linux Mint developers on this achievement, as after seeing what they have achieved within such a short period, I think they could say, ‘this is how its done!’ ;-). Good luck. For downloading, please visit this Linux Mint 14 official release page. Wow, your review is really impressive. I was looking for a detail review of Nadia-Cinnamon, got it here. U ar Sri Lankan… Great work. The transition from Ubuntu to Linux Mint Cinnamon has been the easiest most pleasurable change of operating system ever. I’ve chosen the LTS version “Maya” which I have running on a number of machines.